A sprawling but shortsighted survey of 300 crime films that details sub-genres and character types but offers limited aesthetic analysis and little appreciation for the industry. 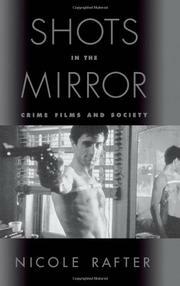 After an acceptable introduction positing the basic truth that crime films both `reflect our ideas about fundamental . . . issues` and `shape the ways we think about [them],` Rafter (Law, Policy, and Society Program/Northeastern Univ.) hands the first chapter of her study to doctoral candidate Drew Todd. It's a mistake, because Todd's `The History of Crime Films` undercuts authorial command with bland observation and callow generalizations about actors and eras. Worse still are his inaccuracies, such as the contention that film noir was needed to bring `superb craftsmanship and technique` to an American cinematography built on `simpler point-and-shoot methods.` (So much for Freund, Toland, and Howe—all active in the 1930s.) Rafter continues, with a full (if partly problematic) survey of the genre, tracing movie criminology, varieties of crime-movie hero, courtroom and prison films, and the future of the genre, among other subjects. Pleasingly, the book brims with variety—this may be the only film book that cites the protagonists of Falling Down, The Last Seduction, and The Godfather in one sentence. But while many of her conclusions about the genre's appealing safety and increasing pessimism are sound, some specific calls raise questions. Dirty Harry Callahan was a department pain, not an `ideal cop`; mid-century courtroom dramas did not necessarily take a `generally uncritical perspective on the judicial system`; action heroes do not always need to examine their dark psyches to gain depth; the homosexual future of The Shawshank Redemption principals is not clear. And must all academics disdain Hollywood and proclaim that independent `critical` films are better (“Roadrunner to the blockbuster's Godzilla,` as Rafter would have it)? While this book fills a niche in the market and provides admirable coverage, it lacks the human insight or delight for the medium that could make it a transcendent critical work. Warshow still stands alone.